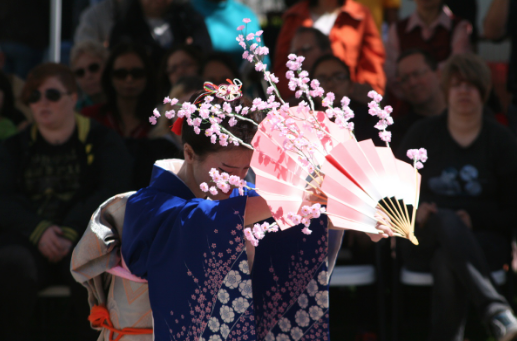 SANTA ANA — The Bowers Museum, 2002 N. Main St. in Santa Ana, will present the Japanese Cherry Blossom Festival on Sunday, April 7, from 11 a.m. to 3 p.m.
Spring is in bloom and the Bowers is celebrating with traditional Japanese dance, music, and art. Enjoy face-painting, fish printmaking, sumi-e (brush painting), and a special Japanese treat. Location: Norma Kershaw Auditorium. Festival is free. General admission to Bowers Museum is free on Festival Sundays for members and Santa Ana residents only. 11 a.m.-3 p.m. Activities (candy sculpting by Shan, display by Kofu Bonsai Kai Club, origami demonstration by Long Beach Japanese Language School, face-painting, mochi treats, and art projects including sumi-e and fish prints for the entire family.